The incidences of many diseases, such as vascular diseases, cancer, arthritis and osteoporosis, rise rapidly with age. Therefore, interventions that delay aging or age‐related diseases would greatly benefit health. To date, healthcare supplements that delay aging or age‐related diseases have received great attention. Collagen Peptides (CPs), a hydrolysis product of collagen, have been widely used in food, cosmetic and pharmaceutical industries. As a healthcare supplement, CPs has a variety of interesting health benefits, including antiatherosclerotic activity and preventing osteoporosis. In particular, much attention has been paid to the anti‐skin aging activity of CPs in recent years. Many studies, from cell and animal experiments to clinical trials, have demonstrated the beneficial effects of CPs on skin aging. 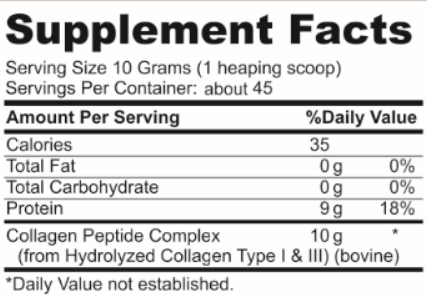 7 Lights Hydrolyzed Collagen Peptides type I & III are sourced from grass-fed, Grade A bovine, and certified hormone-free. Contains high amounts of naturally occurring amino acids. Collagen Peptides are enzymatically formulated through a hydrolysis process so your body doesn't have to break the protein down once ingested. This allows for rapid bioavailability and absorption to support bone and joint health, strengthen hair, skin, and nails, improve gut and immune function, and benefit the body's overall cellular structure, so you can live well. Collagen is the most abundant, naturally-occurring protein found in the human body and is the building block for your cells, tissues, and organs, making it essential for a healthy body. As we age, especially after 30, we naturally lose collagen, and modern diets are less abundant in collagen, which can lead to stiffness, swollen joints, sagging skin, wrinkles, and more. Increasing your body’s reserves with hydrolyzed collagen can improve joint health, digestion, brain health, and give you more youthful-looking skin, thicker, healthier hair, and stronger nails.